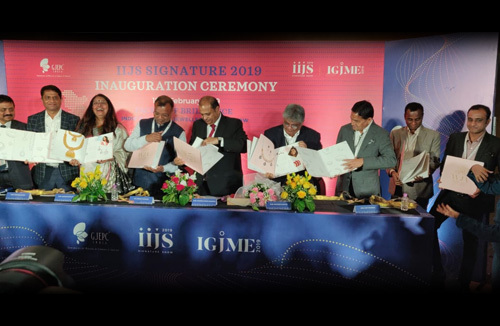 On February 10, 2019, the Womes’s Jewelry Association (WJA) India, launched a coffee table book, “Designers of India” immediately after the inaugural ceremony of the show. The book was unveiled by the Guest of Honour at the Signature IIJS inauguration, Dr Subodh Agarwal, Additional Chief Secretary, Industries, Government of Rajasthan. Also present on the occasion on the dais were Chairman GJEPC, Pramod Kumar Agrawal; Convener of GJEPC’s National Exhibitions Sub-Committee, Shailesh Sangani; Co-Conveners of the National Exhibitions Sub-Committee Kirit Bhansali and Mansukh Kothari; Ashok Gajera, GJEPC’s Chairman, Western Region; Sabyasachi Ray, Executive Director, GJEPC; and Nirupa Bhatt, President, WJA India. The unveiling was done in the presence of leading lights of the gems and jewellery industry and visiting delegates from abroad, as well as the international and national trade press attending the show. What is more, there was a sizable presence of enthusiastic designers – all palpably excited -- who attended the launch of this first book of WJA. The book itself contains bio-sketches and innovative designs of 15 designers. The creative designers (in alphabetical order) are: Archana Jain; Bhairavi Shah; Gitanjali Sahijwaala; Kapila Bhutta; Kirtee Shah; Krishma S. Jain; Laksh Pahuja; Meghna Bag Dass; Priti Bhatia; Priya Kaur; Rashmi Coprum; Soni Amin Shirin; Shrussti Sharma; Tejal Jhaveri and Vijay Soni. The designers themselves are a varied lot in terms of styles, materials and their muses. Yet, there are a couple of threads of commonality between them – their passion for jewellery designing and their abundant creativity. The book itself -- beautifully produced -- is a fitting addition to the drawing rooms of all discerning connoisseurs of jewellery. In a brief address to the audience prior to the launch of the book, Nirupa Bhatt said a few words about WJA India (a chapter of the WJA organisation first set up in the US), formed as a networking association. She emphasised the role of design in the growth of the Indian jewellery industry, both for domestic sale and exports. GJEPC Chairman Pramod Aragwal expressed his happiness at the launch of such a book. Expressing his support to the WJA, he offered any assistance required for strengthening the role of women in the jewellery industry. Pic Cap: The launch of “Designers of India” book.